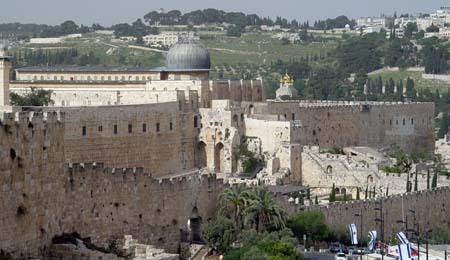 One of the things for a tourist to do for in Old Jerusalem is to walk along the ramparts of the old city. 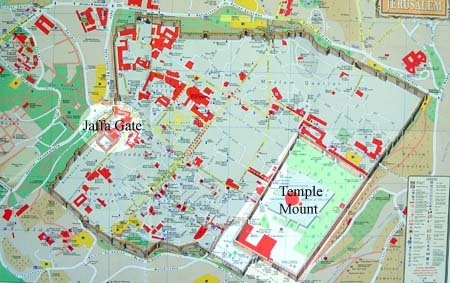 Access to the ramparts is on either side of Jaffa Gate, one direction runs nearly two kilometres up from Jaffa Gate and along the north wall and nearly half way down the east end to the edge of Temple Mount. 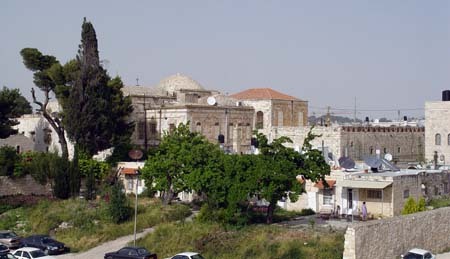 The Armenian Quarter is in the south west corner of the old city, below Jaffa Gate. 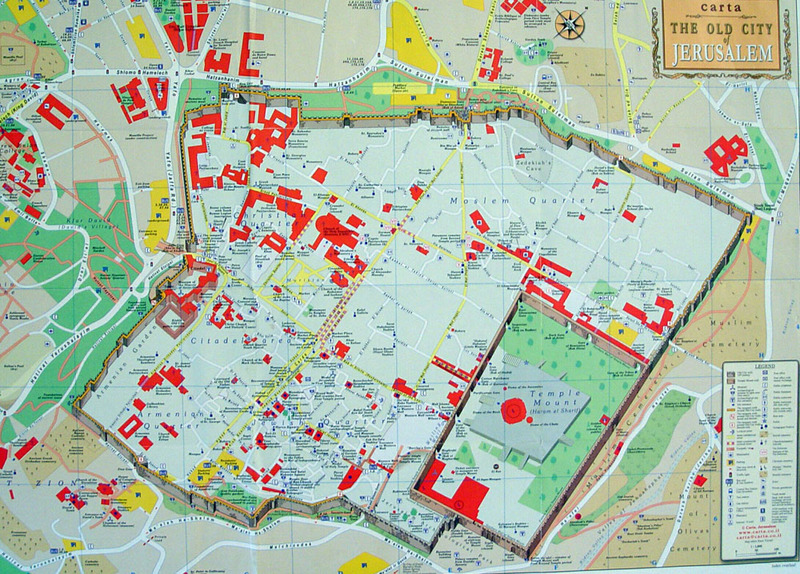 Click here for a larger version of the map. The other direction goes down from Jaffa Gate and along most of the south wall. 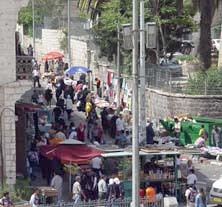 Only for the area bordering the Temple Mount and Western Wall is access denied to tourists for reasons of politics and security. 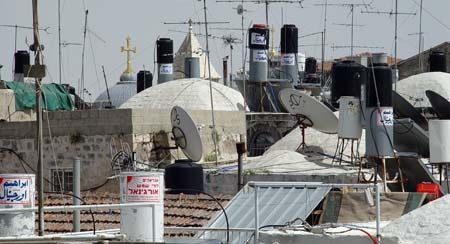 As this image, above, suggests, the view from the rooftops of the old city is not always as inspiring as one might think! 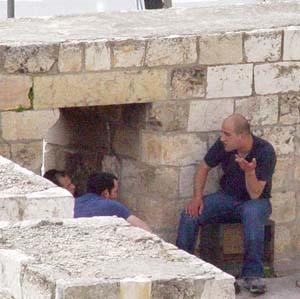 For the most part, however, the walk along the ramparts offers a fascinating vantage point for exploring the old city. 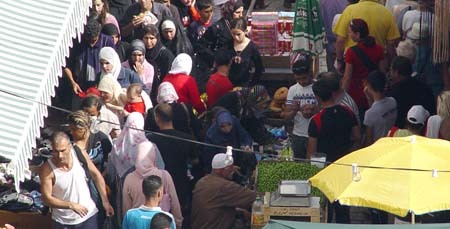 The photo, above, was taken from the top of Damascus Gate, looking down into the market at the entrance to the Moslem Quarter of the walled city, crowded with weekend shoppers taking advantage of the Jewish Sabbath and a day off from work. There's a large dirt soccer field just inside the walls, not far from the Temple Mount where these lads are enjoying a Saturday afternoon game of world's most popular sport. 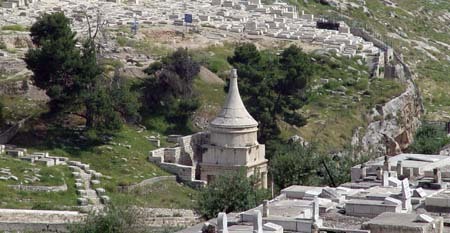 Toward the south eastern end of the ramparts open to the public, one of my own favourite sites in Jerusalem is easy to spot, Absalom's Pillar in the Kidron Valley. The pillar and its neighbouring monuments (not pictured here) are of great antiquity, and would have been as familiar a sight when Jesus and his followers visited the city, as they are to this visitor today. Looking back at the great domes of the Church of the Resurrection from the edge of the Temple Mount, one realises that Jerusalem is indeed built on a hillside. It's a long walk to the south east end of the ramparts and back to Jaffa Gate again, easily on hour's journey over the uneven stonework of the walls, but it's quiet up on the walls, the viewpoint fascination and the walk is well worth the effort. There is something of a greeting party waiting for tourists near the entrance to the western portion of the rampart walk. These fellows greet me with a loud "Vive Israel," to which I smile and wave in the "don't argue with the locals" philosophy of tourism. Well, it turns out that it's all a ploy to catch Israeli sympathisers! 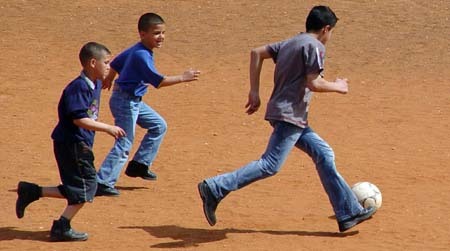 These are Palestinians and they suddenly become enraged at my seemingly positive response. They get up and start to walk in my direction yelling, "To hell with Israel, this is Palestine!" ... fists shaking. I make a beeline to the entrance booth for the ramparts walk, and suspect there can't be much Arak left in the bottle they are hiding in their corner of the wall beside Jaffa Gate! I am particularly interested in the view the ramparts have to offer of the Armenian Quarter and the Patriarchate property in particular. I must say that what I see really strikes a contrast with the Jerusalem on the opposite side of the old city, near Damascus Gate. The Patriarchate is truly a beautiful isle of peace in the midst of a very active and, at times, virulent city. It is interesting to discover that there is another playfield, this one paved in asphalt but pretty much directly opposite the one pictured toward the top of this report. 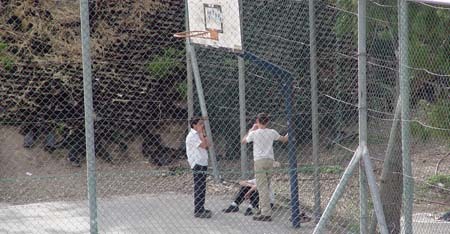 Here a few Israeli youngsters take a break from a game of basketball, only a few blocks from Palestinians their own age, yet a couple of worlds apart. 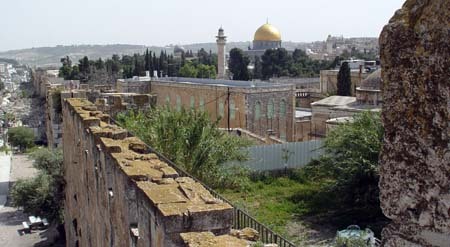 The view at the southern end of the ramparts is breathtaking, showing the portion of the ramparts that is closed to the public, with the Mount of Olives in the distance. 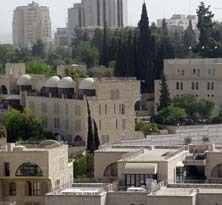 Jerusalem, it may well be argued, is that flash point between two very different orders of experience. 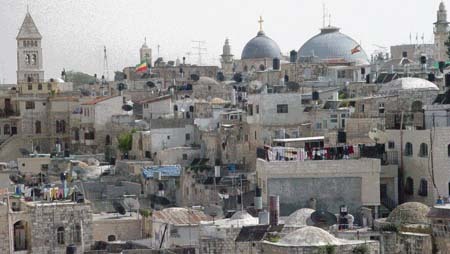 West Jerusalem does look and feel like any other city in the in the industrialised or "first world", while East Jerusalem seems of an entirely other time and space, like any other city in the impoverished and powerless third world. The atmosphere of conflict that reigns in the region may be understood, at least in part, as a head-on collision of planetary dimensions. It is much more than simply a problem between Arabs and Jews, and it is a situation that we in the West ignore at our peril.